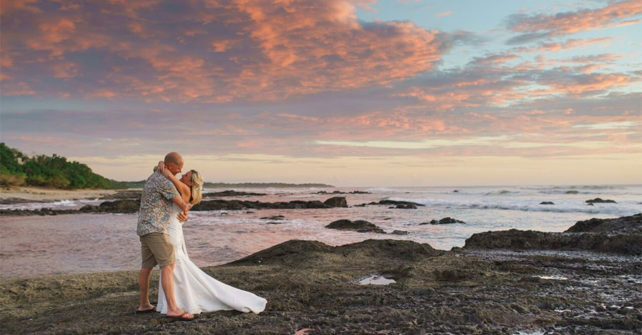 Of course, you want a Costa Rica luxury wedding like you’ve heard about. You can have it! You can say your vows while the waves crash on the shoreline of a private ocean beach. Sleep in a luxury villa right on the Pacific Ocean in Costa Rica. What could be a more romantic way to have your special day? Casa de Luz is a luxury beach villa that has its own section of private beach on the Pacific Ocean. The is the venue for numerous Costa Rica luxury weddings and with good reason. The location of the villa is in the village of Langosta which is right next door to the popular resort town of Tamarindo. As a matter of fact, it is only a five minute walk up the shoreline. You have all the peace and quiet of Langosta and just a few minute walk to Tamarindo for all the parties and beach activities. Casa de Luz offers more than a wedding venue. This is an eight bedroom luxury villa that can sleep up to 23 people comfortably. There is a huge kitchen and a private chef available to handle your reception and parties. A private pool makes for a beautiful evening reception with floating candles. Dancing to the band can be outside in the jungle clearing while wild monkeys and parrots watch the fun from the treetops. Casa de Luz is the perfectly romantic spot for a Costa Rica luxury wedding and that’s why we rent the villa to so many couples for their weddings. There is plenty of room for family and friends, the reception and ceremony. The best part is that it can be an entire week, month or more celebrating with family – not just one day. Call us today to discuss your dream wedding and we’ll help you get it planned. Costa Rica Luxury Wedding at the beach at Casa de Luz, photographed by Costa Vida Photography.